MADISON, Wis. (AP) — Gov. Scott Walker hasn’t officially endorsed anyone in the Republican U.S. Senate primary, but there are numerous signals that his preferred candidate is state Sen. Leah Vukmir. 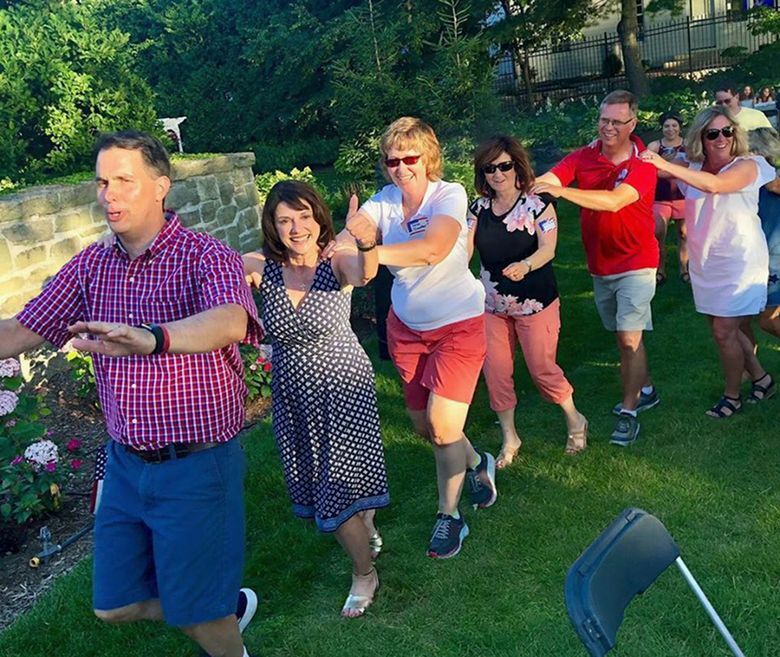 A smiling Vukmir joined Walker in a conga line at a Fourth of July party Saturday night at the governor’s mansion and blasted a photo of it on Twitter, Facebook and Instagram. Vukmir is looking directly at the camera, giving a thumbs up with her left hand, while her right hand is on the shoulder of Walker, who is leading the line. He is wearing blue shorts and a red and white-checked short-sleeve shirt for the holiday. “Heading up the conga line and celebrating America with Scott Walker and our conservative grassroots!” Vukmir wrote in her Facebook post. But Walker, who typically stays out of Republican primaries, hasn’t endorsed Vukmir in the Senate race against Delafield management consultant Kevin Nicholson. The winner of the Aug. 14 primary will advance to take on Democratic Sen. Tammy Baldwin. Nicholson made his own splash on social media a week earlier, posting a video on Twitter of himself on July 1 taking a break during a rain-drenched parade to slide down a tarp on a hillside after being approached by a group of swimsuit-wearing men. Nicholson had on a polo shirt and jeans. The conga line aside, Walker is staying on the sidelines in the race and will support whoever wins the GOP primary, his spokesman Austin Altenburg said Monday. Vukmir has won the endorsement of the state Republican Party and numerous other GOP office holders, including House Speaker Paul Ryan and U.S. Reps. Jim Sensenbrenner, Sean Duffy and Glenn Grothman. But unlike Walker, none of them were in the conga line Saturday night.